and 21 essential areas of your life simply become complete. Yes, I'm ready to experience miraculous breakthroughs in 21 areas of my life! I want to order now for a limited-time special price! 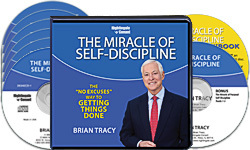 Please send me Brian Tracy’s The Miracle of Self-Discipline: The “No-Excuses” Way to Getting Things Done - including 7 CDs plus Bonus CD and writable PDF Workbook - for just $69.95, which is $90 OFF the regular program price. Take advantage of this limited-time special discount now! TRY The Miracle of Self-Discipline RISK-FREE today! YES! I want to be UNSTOPPABLE in 21 areas of my life!